Buzzword alert: the latest word to loom from storage marketers' lexicon is utility. 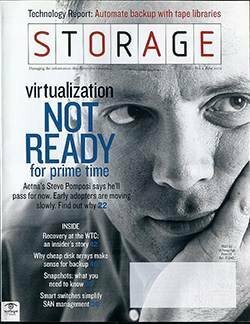 Honestly, do you really know what storage virtualization is? Confused by the virtualization hype? We decode the marketspeak. Sometimes the delete key isn't enough - you need the electronic equivalent of a shredder. Although virtualization has found its way into some corners of enterprise computing, storage managers are not rushing to implement it. Here's why. This powerful technology comes in several flavors - find out which one is right for you. For most IT shops, backup still happens the old-fashioned way: from the host to a direct-attached standalone tape drive. April's unveiling by EMC of Centera, has people thinking how best to pigeonhole this decidedly different array. What kind of DLT tape cartridge to purchase? Why new ATA/IDE arrays, which are cheaper than tape libraries, might be a better bet for backup. Will SAN File Systems Play Larger Management Role? Typical SAN file systems are being positioned to play a more prominent storage management role. The company is actively moving to try to parlay its dominant market positions onto even higher ground. A first-hand look at what one company at the World Trade Center went through to restore operations. "We are not a member of the WideSky program, we never have been, and we do not believe it is in the best interest of our customers," Sorenson says. As storage networks become larger and more complex, smarter switches are one way to manage that complexity. Slowly but surely, the features found in high-end NAS boxes are finding their way to cheaper devices. Everything you need to know about tape libraries. Lawrence Livermore National Labs is pushing the envelope with a new storage cluster that mates 115TB of networked disk with a massive cluster of 600 dual Pentium 4 servers. Storage Bin - Security - from a storage perspective. A further look at business continuance volumes.